A drift boat outfitted with surveying equipment spent just over a week in September crisscrossing Nushagak Bay, taking depth measurements. 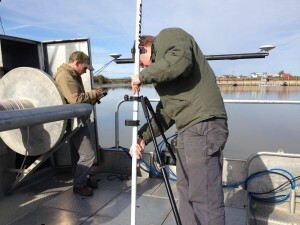 The Army Corps of Engineers funded the survey to plot changes to the river’s channel. They’re doing so to keep an eye on coastal erosion, particularly at the site of the seawall they built at Snag Point 16 years ago. “We’re using a multi-beam echo-sounder, which is basically a very very fancy fish finder,” Per Steenstrup, a hydrological surveyor with eTrac, Inc., the company hired by the Army Corps of Engineers to study the Nushagak, said. He says this survey is the most precise measurement to date of the half square-mile area. The Army Corps contracted the survey to monitor changes to the river’s channel that could intensify shoreline erosion, specifically at the site of the bulkhead at Snag Point. Robert Tedrick is a structural engineer with the Army Corps of Engineers. Tedrick says the $65-thousand-dollar survey is primarily concerned with the fate of the Snag Point sea wall the Army Corps built in 1999. They since turned the site over to the City, which is now responsible for its maintenance. Shoreline erosion has been a major issue for areas in downtown Dillingham. A 2009 Army Corps of Engineers study showed average erosion rates of between two and ten feet per year between 1972 and 2001. The Army Corps of Engineers expect to release the results of this month’s hydrographic survey within a few months. Hannah Colton is a reporter at a in Dillingham.